Alexandra Lange: Have you hugged a geode today? 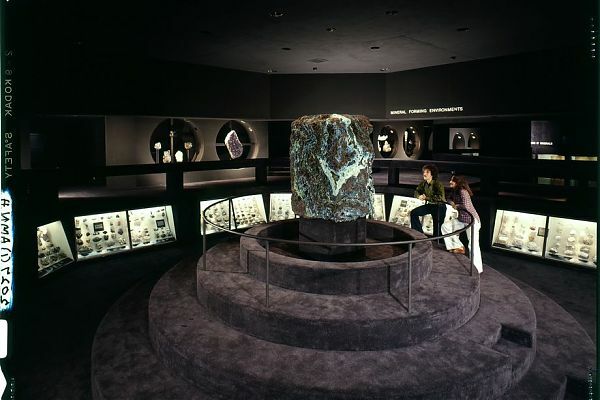 The American Museum of Natural History announced this week the closing of its Hall of Gems on October 26. Designed by architect William F. Pederson in high 1970s style, these galleries are as close as you can get to lounging in a conversation pit in public in New York City. I am sad to see them go. One of my first parenting memories of New York is being at the Museum of Natural History with my toddling son, and happening upon the soft darkness of the (as it’s officially named) Harry Frank Guggenheim Hall of Minerals and Morgan Memorial Gem Hall. Finally, a place to rest! With no hard corners and no other exits, I could park the stroller and let him wander on feet or knees at his will. Maybe he’d learn something from his explorations, maybe not. When you go to a museum with a 2-year-old, it’s as much for change of location as it is to foster a future scientist. He’d learn something from the geode just as he learned from the sandbox. On repeat visits I figured out that this surrender to the visual and tactile was Pederson’s point: more engaging than the old-fashioned taxonomic case, less technological than today’s touchscreens, that era of exhibition design leaned in to the body as a teaching tool.